I have recently been reading the Execution Hour and Shadow Point books by Gordon Rennie which are set around the Gothic War and the space battles of Captain Leoten Semper aboard the Dictator Class Cruiser, the Lord Solar Macharius. I may well do a post detailing these books in the near future but the reason I brought them up now is that the Adeptus Arbites play a very central role in the first book in the form of Arbites Marshal Byzantane and the Punisher Class Strike Cruiser Inviolable Retribution. As any followers of the blog will know, I have a bit of a thing for all of the smaller organisations and institutions of the Imperium that do not commonly make it onto the tabletop – hence my interest in Arbites, Inquisitors, Ad-Mech, Void Whales etc etc. As part of this, and part of recently reading the Gordon Rennie books, I came around to painting up some spare ships I had as a kind of Arbites Strike force. 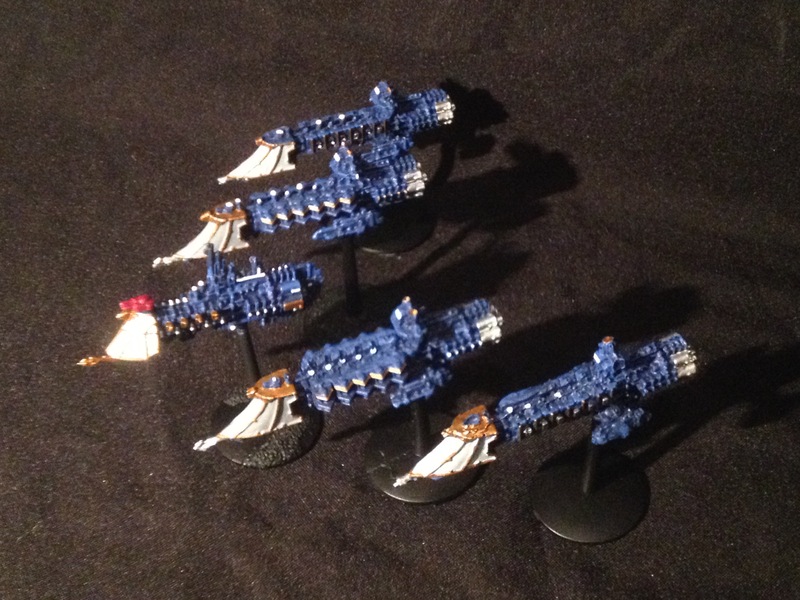 I had two Enforcer Class Light cruisers, and two horrendously cast Dauntless’s left over from my recast order. Adding to them, I had the spare body of a Space Marine Strike Cruiser which I had converted into looking like the Punisher Strike Cruiser above so it all came together rather well. It is rather strange given how powerful the Punisher Class is, being easily the equal of a full Imperial Cruiser, given its small size. It has a 6 hit frame, 6+ prow, 5+ all-round armour, 1 Shield and 2 turrets. 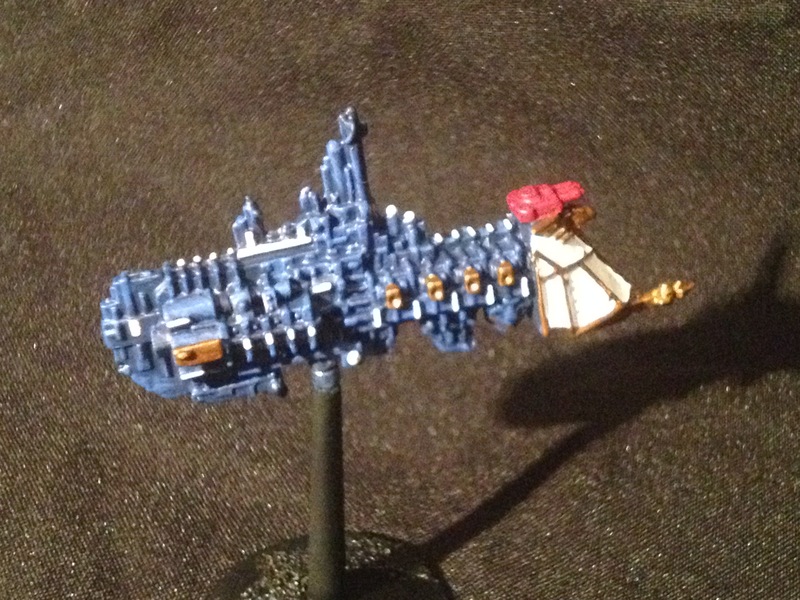 That is pretty standard in relation to a SM Strike Cruiser though a little less armoured. However, it weaponry is rather formidable: FP4 30cm Weapons Batteries on either side, which are unimpressive, but it also has 2 launch bays, and a L/F/R FP4 Bombardment Cannon. If that isn’t enough, it also fires six torpedoes, with a choice of regular torpedoes, melta torpedoes, or barrage bombs (I will cover these in a future post! ), receives +2 Ld for enemies on Special Orders, as well as bonuses to to planetary assault and boarding. not bad for 180pts! This post is getting a little long, so expect a part 2 detailing the Enforcer Class and the Dauntlesses I have appropriated. I hope everyone is enjoying the recent posts etc and please let me know in the comments if there is anything you want to see covered on here.